Abl family kinase activity regulates phagocytic efficiency. (A) RAW264.7 macrophages treated with the Abl inhibitors STI571 (10 μM) or GNF-2 (20 μM) were evaluated for phosphorylation of the Abl substrate CRKL on Y207 by Western blotting. Graph shows relative levels of phospho-CRKL (pCRKL), normalized to total CRKL, from four experiments. *p < 0.05 (versus vehicle-treated control). (B) RAW264.7 were pretreated with Abl kinase inhibitors as in (A) followed by treatment with IgG-opsonized sRBCs for 30 min. Micrographs show the presence of ingested sRBCs in the macrophages. Results are representative of at least four independent experiments. Scale bar, 10 μm. (C and D) RAW264.7 macrophages (C) or BMDMs (D) were pretreated with drugs as in (A) followed by incubation with sRBCs for the indicated times. The phagocytic index was calculated as the number of ingested sRBCs in 100 macrophages. Data shown are representative of two independent experiments. *p < 0.05 (versus vehicle-treated control). (E) RAW264.7 macrophages transduced with retrovirus encoding kinase-inactive Arg (ArgKR) were treated with IgG-opsonized sRBCs for 30 min, and the phagocytic index was calculated as in (C) and (D). Scale bar, 10 μm. Results are representative of seven independent experiments. *p < 0.05 (compared with cells expressing empty vector). (F) RAW264.7 macrophages transduced with kinase-inactive Arg (PK1-ArgKR) or PK1-vector were analyzed by Western blotting with indicated Abs. Relative levels of phospho-CRKL, normalized to total CRKL, from three independent experiments are shown. 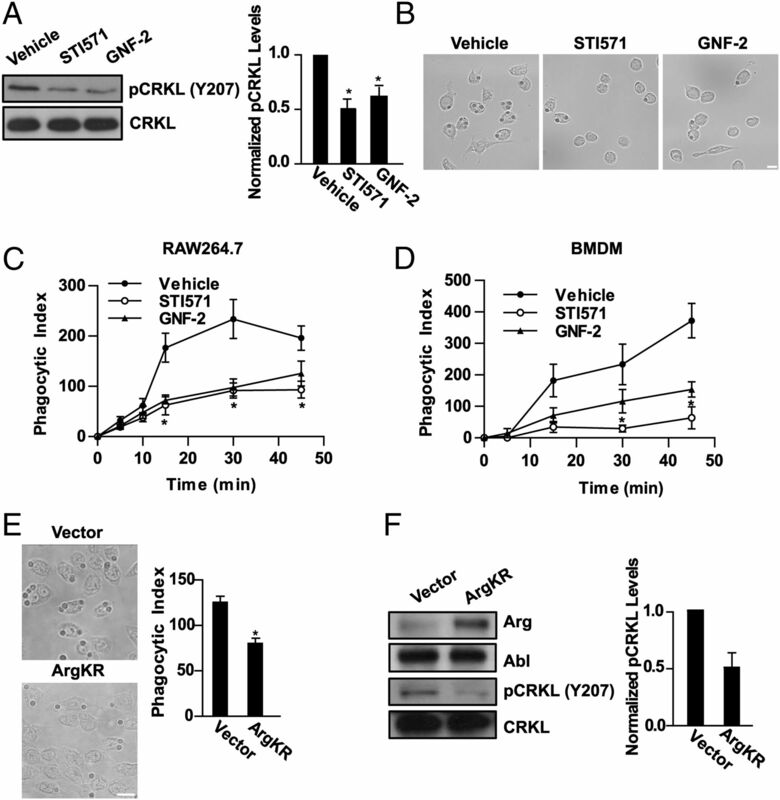 Impaired FcγR-mediated phagocytosis in Abl/Arg null macrophages. (A) Control and Abl/Arg null BMDMs were incubated with IgG-opsonized sRBCs and then fixed and imaged at the indicated time points. Scale bar, 20 μm. (B and C) BMDMs (B) or resident peritoneal macrophages (C) derived from control and Abl/Arg null mice were treated with the IgG-opsonized sRBCs for the indicated times. The phagocytic index was calculated as the number of internalized sRBCs in 100 macrophages. Results from two sets of control and Abl/Arg null mice are plotted for both (B) and (C). *p < 0.05 (versus control macrophages). (D) BMDMs were stained with PE-labeled anti-CD16/CD32 Abs and analyzed by flow cytometry. Data are representative of three independent experiments. Arg colocalizes with F-actin at the phagocytic cup. RAW264.7 macrophages transduced with retrovirus encoding YFP-tagged Arg were treated with IgG-opsonized zymosan for 5 min, fixed, and stained with phalloidin (red) and Hoechst (blue). Samples of zymosan-bound and unbound macrophages were imaged by confocal microscopy. Data are representative of two independent experiments. Scale bars, 5 μm. Abl family kinase activity is required for efficient phagocytic cup formation. (A) RAW264.7 pretreated with either STI571 (10 μM) or GNF-2 (20 μM) were incubated with rabbit-IgG opsonized sRBCs for 2 min. Cells were then fixed and stained for F-actin (green) and Hoechst to mark nuclei (blue). IgG-opsonized RBCs were stained with PE-conjugated anti-rabbit Abs. Phagocytic cups were imaged by confocal microscopy. Scale bar, 10 μm. (B) RAW264.7 cells treated with inhibitors were stimulated with IgG-opsonized sRBCs for the indicated times and processed as in (A). The number of phagocytic cups present in 100 randomly selected cells was counted. Results are representative of three independent experiments. *p < 0.05 (versus vehicle-treated cells). (C) BMDMs from control and Abl/Arg null mice were stimulated with IgG-opsonized sRBCs for 5 min and processed as in (A). The numbers of phagocytic cups in control and Abl/Arg null cells were quantified as in (B). Results from two sets of control and Abl/Arg null BMDMs are quantified. Scale bar, 10 μm. Arrowheads point to F-actin–rich cups. Abl family kinases are activated by FcγR engagement downstream of Src kinases. (A) RAW264.7 cells were serum starved 4 h, then treated with either STI571 (10 μM) or GNF-2 (20 μM) 2 h prior to FcγR cross-linking. After serum starvation, cells were incubated with the anti-FcγR mAb 2.4G2 followed by anti-rat IgG cross-linking for the indicated times. Graph shows quantitation of phospho-CRKL (p-CRKL) levels, normalized to total CRKL, 5 min after FcγR cross-linking from five independent experiments. *p < 0.05 (compared with FcγR-stimulated control cells). (B) RAW264.7 cells pretreated with Abl inhibitors as in (A) or with the Src inhibitor SU6656 (2.5 μM) were stimulated with FcγR cross-linking for 10 min followed by cell lysis and immunoprecipitation of the γ-chain. Graph shows relative levels of phospho–γ-chain, normalized to total γ-chain, from a representative experiment; similar results were obtained in two independent experiments. (C) RAW264.7 cells were serum starved 4 h. Two hours prior to FcγR cross-linking, cells were pretreated with inhibitors as in (B). Cells were treated with the anti-FcγR mAb 2.4G2 followed by anti-rat IgG cross-linking for 5 min. Line denotes where intervening lanes have been cropped out. Graph shows quantitation of phospho-CRKL, normalized to total CRKL, from four independent experiments. *p < 0.05 (compared with FcγR-stimulated control cells). (D) RAW264.7 cells pretreated with Abl or Src inhibitors as in (B) were stimulated with FcγR cross-linking for 10 min. Graph shows quantitation of phospho-FAK (pFAK), normalized to total FAK, from a representative experiment; similar results were obtained in two independent experiments. (E) RAW264.7 cells treated with either Abl or Src kinase inhibitors as indicated were stimulated with opsonized sRBCs, and phagocytic index was measured after 30 min. Scale bar, 20 μm. *p < 0.05 (with respect to vehicle), #p < 0.05 (with respect to SU6656). Abl kinases modulate Syk activation downstream of the FcγR. (A) RAW264.7 cells were serum starved 4 h, then treated with STI571 (10 μM), GNF-2 (20 μM), or SU6656 (2.5 μM) 2 h prior to FcγR cross-linking. For cross-linking, cells were incubated with the anti-FcγR mAb 2.4G2 followed by anti-rat IgG cross-linking for 5 min. Graphs show quantitation of phospho-Syk (pSyk) Y346 and phospho-Syk YY519/20, normalized to total Syk, from three and four independent experiments, respectively. *p < 0.05 (compared with FcγR-stimulated control macrophages). (B) Control and Abl/Arg null BMDMs were serum starved 4 h, then cross-linked and processed as in (A). Graphs show quantitation of phospho-Syk Y346 and phospho-Syk YY519/20 levels, normalized to total Syk, from seven and three experiments, respectively. *p < 0.05 (compared with FcγR-stimulated control macrophages). (C) RAW264.7 cells were treated with drugs as in (A) or with piceatannol (25 μM) as indicated. 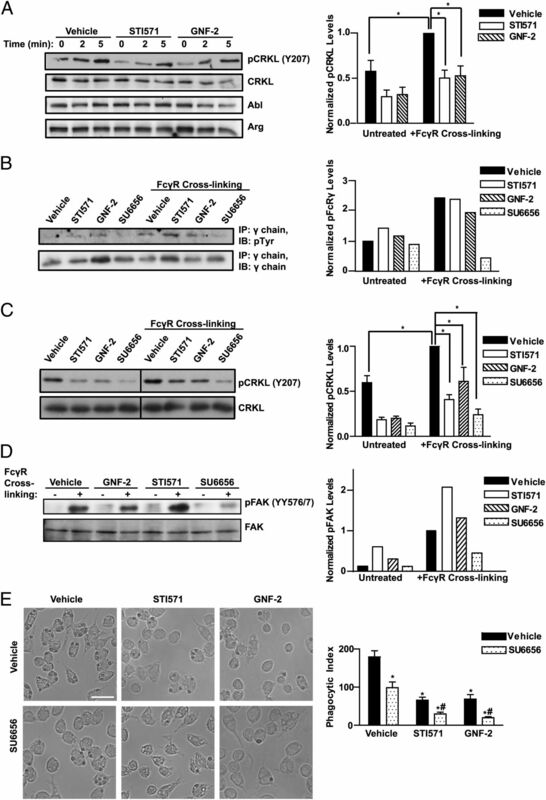 After FcγR cross-linking, cells were assayed for phospho-CRKL (pCRKL) levels by Western blotting. Graph shows quantitation of phospho-CRKL levels, normalized to total CRKL, from two independent experiments. (D) 293T cells were transiently transfected with myc-tagged Syk and constitutively active Abl (AblPP) or kinase-defective Abl (AblKR) and analyzed after 48 h for phospho-Syk Y346 levels. Phospho-Syk levels were normalized to total Syk and expressed as fold change over vector. Graph shows quantitation from three independent experiments. *p < 0.05 (compared with cells expressing empty vector). 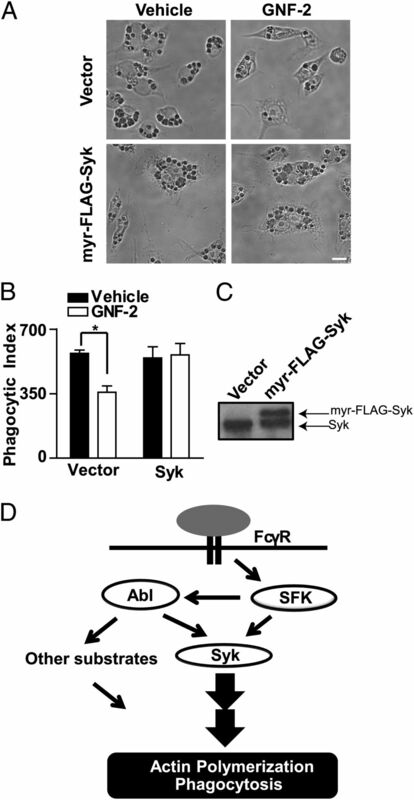 (E) Syk was immunoprecipitated from 293T cells transfected with MigR1-myr-FLAG-Syk, then incubated with purified full-length Arg kinase (FL) or a C-terminal Arg fragment (CT), in the presence or absence of ATP. Phosphorylation of Syk at Y346 in the presence of full-length Arg and ATP is shown. Phospho-Syk levels were normalized to total Syk, and the fold increase in phospho-Syk after incubation with purified Arg was quantitated from three independent experiments. *p < 0.05 (versus no Arg or ArgCT). Overexpression of Syk rescues phagocytosis in macrophages with decreased Abl/Arg kinase activity. (A) RAW264.7 cells transduced with MigR1-myr-FLAG-Syk were treated with GNF-2 followed by incubation with sRBCs for 30 min. Scale bar, 10 μm. (B) Phagocytic index was calculated and the results presented as an average from three independent experiments. *p < 0.05 (compared with vehicle-treated cells). (C) Expression of myr-FLAG-Syk in RAW264.7 macrophages was confirmed by Western blotting. (D) Model for Abl family kinase signaling during FcγR-mediated phagocytosis. Upon FcγR ligation, Src family kinases (SFK) activate Abl family kinases. Src and Abl kinases promote the phosphorylation of Syk, which drives particle internalization. Abl kinases may also modulate the phosphorylation of other substrates to promote actin organization at the phagocytic cup. Figure S1. Inhibition of Abl kinases reduces phagocytosis of IgG-opsonized zymosan. Figure S2. Generation of Myeloid-Specific c-Abi Knockout Mice. Figure S3. Abl/Arg null macrophages exhibit decreased phagocytosis of IgG-opsonized zymosan. Figure S4. Phagocytosis in single Abl and Arg null cells.